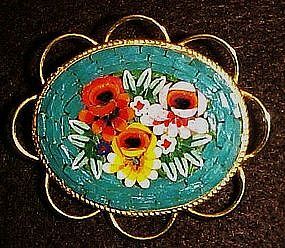 Nice large gold tone pin with glass mosaic floral design of multi color flowers. Measures 1 5/8" x 1 3/4" oval. Bright shiny gold tone and is in perfect condition. Unsigned.